Pine cones, Gingerbread Men, Maple Leaves, ? 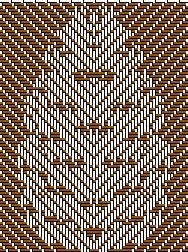 I was asked if I can weave pine cones onto towels by a very influential woman of God in my life. Of course, I said "Yeah! Sure!". Knowing full well that with a little bit of research and effort, I would be able to weave just about any image out there with a 3/1 twill. Well, I think I have what I'm looking for. These are screen shots of the front and back of the image. So....I was wondering.......what do you think? Does it look like a pine cone? 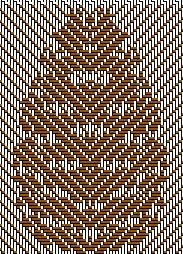 I have the loom beamed, as of last night, in a point twill 1-32 and am planning on a natural cotton with a band on either side of the towel with a strip of pine cones. 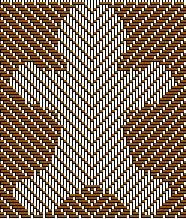 Since I put enough on the loom for four sets of two, I figured I would kill two birds with one stone and make my mother-in-law a set of gingerbread men towels for her kitchen. She's a little obsessed with gingerbread men....it's her kitchen theme that has spilled into the dinning room and living room:) Gotta love her!!! That leaves (ha ha ha sounds like a pun) room for one more set or two. 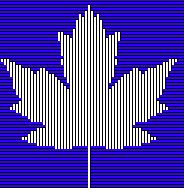 I thought a maple leaf would be fun and this is about how far I got with that image. They look like pine cones to me. I would say that is a very convincing pine cone. What software do you use? absolutely!!! i'm new to weaving and i didn't know you can do that. how do you do that? can i do that with a 4 heddle? will you share draft? this is sooo cool. they do look like pinecones......are you using a computer program? Fantastic images, I particularly love the maple leaf being Canadian! As always Shannon, you rock! Great job!!!! Looks just like a pinecone to me too. Being the dense one, is that double weave - or what is it really? Shannon, Pine cones are great, I Love the GBmen! 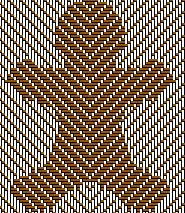 Send me an image of those when they are woven.